Quentin Tarantino is an increasingly rare breed in the modern Hollywood landscape. He's a true auteur director who makes the movies that he wants to make and they wind up being financially successful and award-worthy. Yet, somehow, he's never been coaxed by a big studio to direct a franchise entry of any kind. So what franchise might be able to change that? 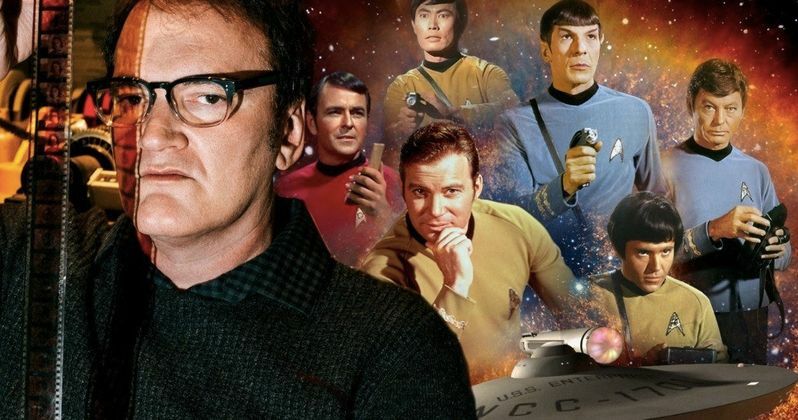 Star Trek, as it turns out, could possibly make Tarantino boldly go where he's never gone before. TMZ caught up with Quentin Tarantino very briefly recently on his way to catch a flight. When asked if he would actually want to direct a Star Trek movie, he wouldn't totally rule it out. Here's what he had to say about it. "It'd be worth taking a meeting about." That isn't all that definitive, but the fact that Quentin Tarantino would take any of his time to even have a meeting about doing a Star Trek movie is noteworthy. Granted, he tossed this answer to TMZ very quickly while walking by their camera as quickly as possible, but he did take a second to consider his answer. This whole idea of Tarantino directing a Star Trek movie only came up because the director was recently asked whether or not he would be interested in doing a Star Wars movie. He revealed that he would be more interested in the world of Gene Roddenberry. Not that he's considering doing either of those things, nor has he actually been approached, but given the choice, he'd prefer Star Trek. TMZ also pressed Quentin Tarantino about his promise to retire after making two more movies. In response, the director simply held up two fingers, indicating that he is indeed planning to stop directing movies after two more. Considering that it has already been announced that he is going to make a movie that tackles the Manson murders, that means he is only going to make one more movie after that. So if he's ever going to do a franchise movie, like Star Trek, it would have to happen relatively soon. And if he really is going to retire after two more movies, why not do a franchise movie? It's territory that Tarantino has never ventured into and he could go out on something new. For what it's worth, no director has been officially hired for the in-the-works Star Trek 4, which will reportedly feature Chris Hemsworth return as George Kirk, starring alongside Chris Pine's James Kirk. How exactly that is going to be made possible hasn't been made clear yet, but J.J. Abrams is too busy with Star Wars: Episode IX to figure that out right now. Odds are, Justin Lin will come back following his work on Star Trek Beyond, but maybe Paramount will at least have a meeting with Tarantino about it. But probably not.